It is very rare to find a golf course on the Spanish Costa del Sol that was constructed more than 50 years ago and even rarer, that after five decades, it still provides a stern test to even the best golfers. Both are true of the Real Club de Golf Sotogrande. Back in 1964, Sotogrande was a largely uninhabited area just north of Gibraltar, with only a few pockets of population located in a few country estates. An American citizen, Joseph McMicking, who lived in the Philippines, visited the area and could see the land's great potential, with its excellent weather, wonderful mix of countryside and proximity to the stunning coastline. In that same year he initiated what is now regarded as one of the best developed residential and tourism areas in Europe and its first golf course: Real Club de Golf Sotogrande. Opened in 1964, the course was designed by Robert Trent Jones. It was his first European course, and it is a credit to the man and his design that the par 72, 6,224-metre layout is still enthralling players after all these years. Sotogrande is a private members' club, which maintains an air of calm and restrained sophistication, whilst at the same time providing a warm welcome to visitors. The clubhouse is well designed and elegant, the food and drink excellent and well presented, and the changing rooms large with showers to die for. Between 1998 and 2001, Sotogrande was used for European Tour Qualifying Finals and its class, quality and reputation are recognised globally. In Sotogrande's 30th year, it was awarded royal status. The challenge that awaits every golfer at Sotogrande was well summed up by the designer, Trent Jones, when he once described a golf course as a battleground: players attack the course and it is the architect's obligation to defend it. This he has achieved wonderfully at this Spanish masterpiece. Every hole requires the player to plan his attack with care and execute the shots successfully to escape the many strategically placed bunkers and water hazards. The fairways appear wide and the semi-rough is Augusta-like in its appearance, but stray from the short stuff and the wonderful cork, eucalyptus, pine, oak and palm trees – which line almost every fairway – will make life and making par very difficult. Only when the ball drops into the hole will the golfer be able to relax. The putting surfaces are expertly shaped and contoured and they are all wonderfully maintained, making them fast and true all year round. Holes to look out for include the 4th, a wonderfully difficult 202-metre par three with a wickedly sloping green. The 7th is a cracking par four measuring 381 metres with a narrow green and water guarding the right side so it's a tough proposition. Holes 12 to 14 and 16 to 18 are all tough, featuring well-placed water hazards. It's quite a finishing stretch. To help the golfer at Sotogrande, always remember that most of the greens are elevated and that a lot of the slopes in the fairways are very subtle but not insignificant, so make sure to take enough club for the distance, and then take one more. The course underwent a massive upgrade in 2015-16 which was completed by Roger Rulewich and David Fleury in two stages to allow members the use of one nine at all times. Putting surfaces had grown by up to 40% of their original size over time so green shapes were fully recovered, with sub air systems installed to ensure their optimum performance. Fairways and tees were also reconstructed, using 41,000 kilometres of drainage, 71,000 tonnes of sand and 37 hectares of Bermuda grass. This was my first time back to Sotogrande since the 2001 European Tour School. From what I remember it was a fine course with fast undulating greens…..and that it was freezing! The view from the clubhouse down the first fairway whets the appetite with its open fairway this hole is a nice introduction to the course. I believe the strength in Sotogrande comes from hole 2 through to hole 7 especially holes 3,5 and 7. The third is a great short par 4 doglegging from right to left to an elevated green which slopes from left to right. Hole 5 starts with a semi blind tee shot which leaves the player a short to mid iron to an angled green. I really like the way this green sits and club selection is vital for successful outcome. In my opinion hole 7 is the best on Sotogrande. If you manage to get your tee shot in play from the elevated tee you are left with a perilous approach to a long thin green which is flanked by water on the right and bunkers on the left! Hole 11 (Pictured) is cracking short par four to a raised green which is a recurring theme throughout Sotogrande. The course then disappoints a little for the next three holes giving more of a Floridian feel to the holes. Holes 15 - 18 are decent enough but do not quite reach the heights of the front 9. All in all I thoroughly enjoyed my re visit to Sotogrande and with its variety of holes and generous fairways golfers of all levels will enjoy their game here. Didn't realize it was 9 years since I came here first. My opinion this time around is even better. What a classy place! Really understated and not at all "in your face" as I found in Finca Cortesin. Greens are exceptionnal. The whole course rather flat for the area (compared to silly slopes in Finca for example). A real members club that truly deserves its status. Favorite hole was number 7. As it was the first European design of Robert Trent Jones back in the mid-1960s, Sotogrande enjoys an undeniable architectural significance. The course is laid out on a massive scale, with fairways routed in an old-fashioned out and back style and water in play at most of the holes on the back nine – indeed, there’s more than a hint of Florida on these palm-fringed holes which occupy rather uninspiring, flatter terrain. The recurring raised green theme with bunkers either side of the putting surface might wear you down after a while, especially if you find yourself in the greenside sand too often, because recovery shots from these hazards to greens stimping around the 12 mark certainly test your short game to the very limits. The downhill par four 7th is probably the best hole on the front nine, the approach shot played downhill to a green that’s protected by a pond all along its right side, with bunkers in front and to the left of the putting surface. Trees also circle the back left portion of the greensite, making this one of the most photogenic holes on the card (pictured here). The short par four 11th was my favourite on the back nine, playing sharply uphill to a back to front tilted green, before the routing drops holes down to level ground at the 12th, where water then dominates on half a dozen of the remaining holes, bringing a cape tee shot (at the 14th) and peninsula greens (at the 13th and 17th) right into play. There’s no doubt the recent multi-million-euro renovation of this course has breathed new life into a layout that should now be fit for purpose for another fifty years. With nearby Valderamma also undergoing a recent Kyle Phillips upgrade and a second course planned for that particular venue, these are exciting times for upmarket golf facilities in this part of the Costa del Sol. Wonderful course. Played there in September 2014 and even though unfortunately half of the fairways were completely burned as they were planting new grass, I really enjoyed the experience (even though a little discount would have been appreciated rather than a not really needed complimentary buggy). Definitely more enjoyable than the more famous Valderrama. 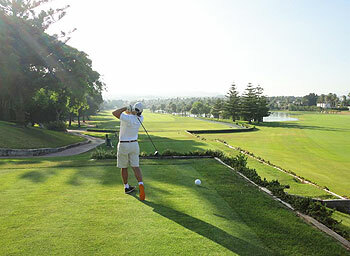 Many beautiful holes with great villas overlooking the fairways. Don't miss it if you are in the area. In my top 10 of courses played - old style design but that makes it better. A must play course. Real Sotogrande is maybe the best Club in the area. Some will say Valderrama, San Roque or Finca cortesin are better courses, I would not surely agree on that. Valderrama has maybe some of the best maintenance in the world, Finca has great views and fantastic greens while San Roque has great tradition, but as a golf course in my opinion this jewel from RTJ is the best of all of them, ormaybe the one I like most to play. 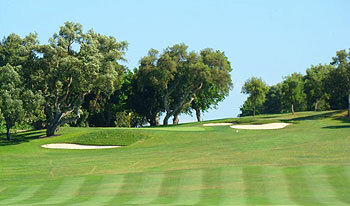 The Club is set just meters away from the Sotogrande Bay and shows maybe the highest end members of the country. Once you arrive, despite not being a member, you are treated like one of them, as the Club values its visitors very much. The practice facility ... ufff, some great grass, fast putting green and very wide chipping areas. The course is that course that good golfers will really enjoy: strategy, cleverness, ball striking and good decisions are needed to score, but it is not an impossible course to post a decent round. Some great golf holes like 5th, 7th (my favourite), 11th, 14th, 15th and 18th. But once you finish the round is not over, a good lunch and take a shot at the par 3 course, excellent kept and a lot of fun, with 2 long holes (220 and 250yds) and some great 110-140yds par 3s. A visit that will pay every euro from the minute you arrive. and take a good look at the proshop, the already have the apparel for the 2014 Ryder Cup at Gleneagles. Real Sotogrande is one of those Golf Clubs that when visited show you not only a great golf course, a very charming Club House but also a lot of tradition, honor, respect and all those things that make this sport so special. Once in the Club, I was able to see in the boards along the path very famous winners such as Rory, Gonzalo F.Castaño, Sergio Garcia and a lot more that show you what space this Club occupies in the History of golf in Spain. I was invited by the General Manager and after a short meeting I played the venue with a former Club Champion, which is a real priviledge. The course reminds me a lot of Valderrama, taking into account the piece of land is quite similar and the features RT Jones used to have are also shown in this course. There are many great golf holes, strategic shots and a lot of brain to be used if you want to score. Maintenance is at the highest level, fairways were like carpets and greens were rolling really very fast despite having had aireation 2 weeks before. I believe it is a course that if played a second time in the same trip, will give you a really good option to score well. In some holes the unkowledge makes you pay with some strokes, you have to carry the yardage book and think very well before every shot. One more thing: missing the green in the wrong side can cause really high numbers. When thinking of the best holes I have to say 7 and 10 are excellent and challenging, long and with a very tough approach shot ( I bogeyed both of them from the centre of the fairway!). So, if planning a trip to Spain, make sure you dont miss this one! for me Sotogrande is a very special course and i play it as often as i possibly can. It is the perfect antidote to modern 7500+yd course where the only subtlety is what sort of driver you use. This was a work of genius by Trent Jones and has stood the test of time amazingly well. one reviewer here talks about ordinary holes including the !st. at 340m or so it looks easy enough but i have watched the European Amateur team championships that are played here and seen players practically reach the green and take 5 to get down. TJ understood that there are lots of different ways to get to a golfer and its not just length or double dogs legs or 230 yard carries. by far the most beautiful course i have ever played (and i have played many of the top 100 in the world) it is also a test of good golf. you may not lose many balls (although the possibility is there) but you have to hit the ball very well to score. few people very play to there handicap here. if you get the opportunity to play here, jump at it. Played in Oct.2009. Very nice scenery with some mix of open holes and narrow holes, long holes and short holes. Enjoyed very much.